SpaceX has delayed the planned Feb. 25, 2018 launch of the Spanish communications satellite Hispasat 30W-6 from Space Launch Complex 40 at the Cape Canaveral Air Force Station in Florida. Here, a SpaceX Falcon 9 launches the GovSat-1 satellite from the same launchpad on Jan. 31, 2018. SpaceX has delayed its weekend launch of a Spanish communications satellite to allow time for extra tests on the mission's Falcon 9 rocket. 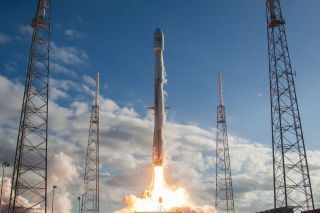 The Falcon 9 was scheduled to launch the Hispasat 30W-6 communications satellite Sunday (Feb. 25) at 12:35 a.m. EST (0535 GMT) from Space Launch Complex 40 at the Cape Canaveral Air Force Station in Florida. But on Saturday, SpaceX said it needed extra time to test the rocket's payload fairing, the clamshell-like nose cone that protects satellites during flight. A new launch date has not yet been announced. SpaceX is not the only one hoping to launch a space mission from Cape Canaveral Air Force Station in the next week. On Thursday (March 1), NASA and the United Launch Alliance are scheduled to launch an Atlas V rocket carrying the new GOES-S weather satellite from Space Launch Complex 41 at the station. An artist's illustration of the Hispasat 30W-6 communications satellite in orbit. So, SpaceX may only have a short time to complete the Falcon 9 fairing checks before having to wait until after the GOES-S launch later next week for another opportunity. "The launch will take place as soon as the incident is resolved and the launch window with the greatest chances of success is available," Hispasat, the satellite communications company that owns the Hispasat 30W-6 satellite, said in a statement. Hispasat 30W-6 will provide television, broadband and other communications services to Hispasat customers across Europe, North Africa and the Americas, according to a Hispasat description. The satellite will orbit the Earth in a geosynchronous orbit in the 30-degrees west position, and serve as a replacement for the older Hispasat 30W-4 satellite. Hispasat 30W-6 is designed to last at least 15 years in orbit. The launch of Hispasat 30W-6 will follow close after SpaceX's successfully launch of another mission for Spain. On Thursday (Feb. 22), a SpaceX Falcon 9 rocket launched the Paz Earth radar-imaging satellite into orbit for the Spanish company Hisdesat. Two prototype satellites for SpaceX's Starlink broadband internet constellation also launched on that mission.